ICE Wales Cymru supports activities that help get young people interested in civil engineering. ICE visits schools across Wales to give young people the chance to build miniature version of the Second Severn Crossing. Using our model cable-stayed bridges, children experience bridge building at first-hand, while wearing hard hats, high-vis vests, gloves and goggles. After the bridges have been built, each child gets the chance to walk across and test their engineering skills. The activity is mainly aimed at primary schools, but we can also arrange visits to secondary schools. Each bridge-building session is presented by an engineer, with support from ICE 'construction ambassadors'. Bridge to Schools is organised in partnership with ConstructionSkills Wales, Careers Wales and Mid Glamorgan Education Business Partnership. To find out more or to arrange a visit to your school, please download the Bridge to Schools leaflet. This is an engineering competition for secondary school pupils. The aim of the scheme is to encourage Year 9 (14 year old) students in South Wales to consider a career in engineering. It's run by the ICE Wales Cymru Graduates and Students Committee, with sponsorship from local engineering companies. The scheme is run in conjunction with Tomorrow's Engineers Week. This activity promotes engineering, construction, manufacturing and technology careers for students aged over 16. ICE Wales Cymru North Wales Branch helps organise the event. The Millennium Stadium in Cardiff is the national stadium of Wales. It's the home of the Wales national rugby union team and the Wales national football team also plays matches there. Initially built to host the 1999 Rugby World Cup, it's gone on to stage many other large-scale events, such as the Tsunami Relief concert, the Super Special Stage of Wales Rally Great Britain, the Speedway Grand Prix of Great Britain, and numerous music concerts. The Millennium Stadium is owned by Millennium Stadium plc which is a subsidiary company of the Welsh Rugby Union (WRU). The stadium was designed by a team led by architects Bligh Lobb Sports Architecture. WS Atkins were the structural engineers, and the building contractor was Laing. The total construction cost of the stadium was £121 million of which the Millennium Commission funded £46 million. 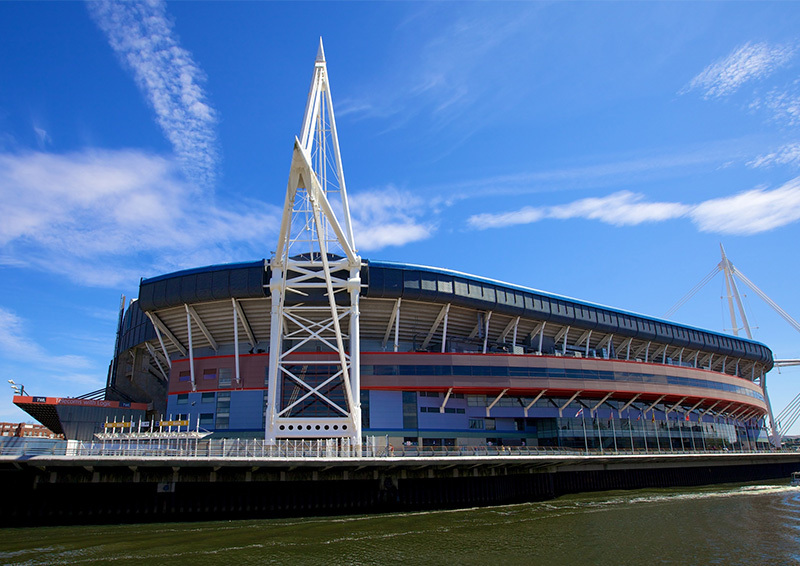 The stadium opened in June 1999, and the first major event to be held was an international rugby union match on 26 June 1999, when Wales beat South Africa in a friendly by 29–19, in front of a test crowd of 29,000. With total seating capacity of 74,500, it's the third largest stadium in the Six Nations Championship behind the Stade de France and Twickenham, which is the largest. It's also the second largest stadium in the world with a fully retractable roof, and was only the second stadium in Europe to have this feature.